After breeding it spreads south to southern parts of Chile and north to Ecuador, and has also been recorded as far north as Panama and Colombia – probably a result of mass dispersal due to food shortage in El Niño years. Its major habitats include shallow seawater and rocky shores.. The scientific name commemorates the French explorer Louis Antoine de Bougainville. 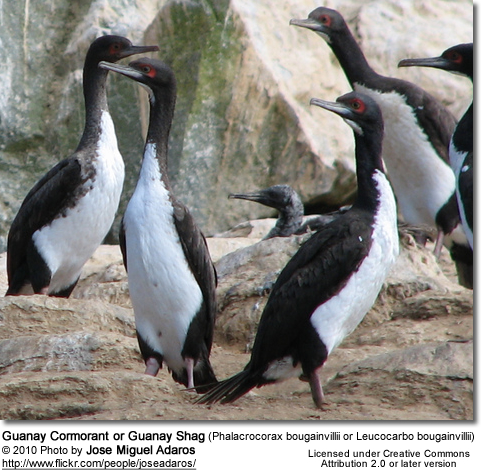 The Guanay Cormorant is similar in coloration to the Rock Cormorant, Phalacrocorax magellanicus, but larger, measuring 78 cm from the tip of the bill to the end of the tail. Its bill is greyish with some red at the base. The face is red with a green eye-ring. It has roseate feet. The head, neck and back are black as are the outer parts of the thighs. The throat patch, breast and belly are white. In breeding plumage it has a few white feathers on the sides of the head and neck. Breeding occurs year round with a peak in November and December. The nest is built of guano on flat surfaces on offshore islands or remote headlands. There are up to 3 nests per square meter in high-density colonies. The Guanay Cormorant lays two or three eggs of approximately 63x40 mm in size. It feeds mainly on the Peruvian anchoveta, Engraulis ringens, and the Peruvian silverside, Odontesthes regia, which thrive in the cold Humboldt Current. 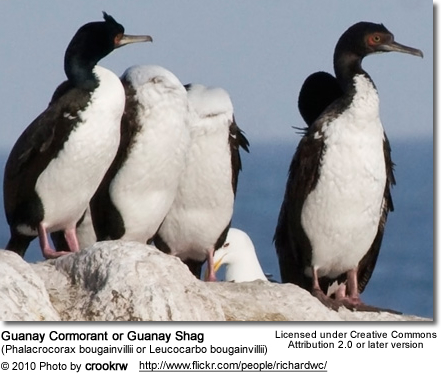 The Guanay Cormorant is the main producer of guano. Habitat loss and degradation and over-fishing have resulted in a steady decline of the population of about 30% from an estimated figure of 3 million birds in 1984. This species is listed as NT (near threatened) by IUCN.